GSBTB Open Music School Manager Tom Young on the birth of the music school and why it’s time to celebrate! I tend to think of cities like scars on the face of the earth. Although it is possible to find beauty in architecture and design, this is not what makes cities truly beautiful. What brings them to life and makes them worth living in, and what inspires me to be creative myself, are the artists and creative misfits living and working inside these scars; the people who create surrounded by destruction, who make art amid chaos. At the risk of stating the obvious: Berlin is full of these people. There are myriad reasons why people are here. Some find their way here as part of an elaborate life plan. Some follow friends and family. It seems quite a few stayed too long after a party. Some were born here. And many others were forced here – through incredibly difficult migratory routes – and have little choice but to be here. Within this diverse population are thousands and thousands of people with creative talent. Due to the bureaucratic difficulties and frustrations that come with moving to a new home, however, we don’t often get to see this creative potential. Life as a newcomer is often too hectic and difficult. These talents are dormant like a volcano, or firewood that is just waiting for a spark to explode. I started the GSBTB Open Music School in May, 2016. The concept of the Open Music School was born when I visited a few events organised by GSBTB’s Open Art Shelter in late 2015 and early 2016. A friend of mine suggest I tag along. As a lot of migrants with limited language skills tend to be, I was shy and nervous walking into a room full of people speaking languages I didn’t. I wasn’t scared of other people. I feared my own inability to communicate. A kid playing with Tom’s guitar. Photo: Emilie Anomalie. I was, of course, welcomed with open arms. I enjoyed the first session I attended so much that I went back the next week. 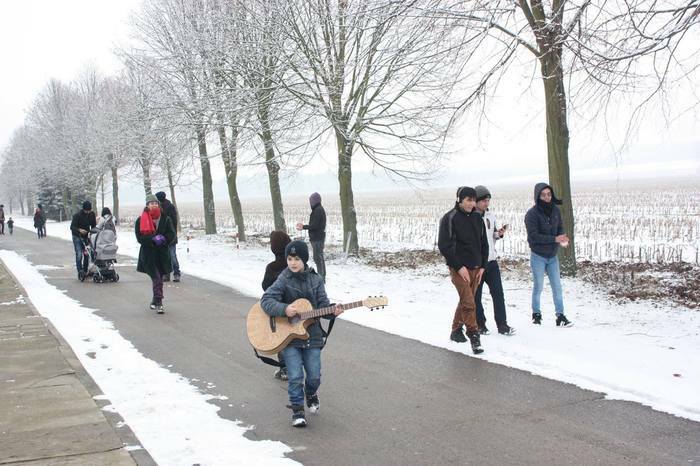 This time I brought my guitar along with me as an “ice-breaker”. It melted language barriers instantly. We passed my old guitar around, letting out painful noises, unintentionally annoying the other participants with our racket. No one could actually play the guitar. We were just pretending. We were playing a game of “I play guitar”, laughing and patting each other on the back as we played. Playing at playing guitar. Photo: Emilie Anomalie. The next week I brought two guitars. I attended several more Open Art Shelter sessions, including several trips to Neuhardenberg, in Brandenburg. The guitars were always popular, but almost no one could actually play. Some of the young men who had been the most enthusiastic about the guitars started asking for tips. I’m not the world’s greatest guitar player or teacher, but I wanted to help. Personally, I know the cathartic benefits of learning and playing an instrument very well. I have always found solace in music. I believe it is amongst the most important communication tools we humans have. It is a tool to communicate things that cannot be explained with spoken languages, no matter which one you’re fluent in. It dawned on me that perhaps the model Open Art Shelter was using, of providing a safe, supportive and creative space for people to simply be and communicate with one another, could also be set in a musical context. 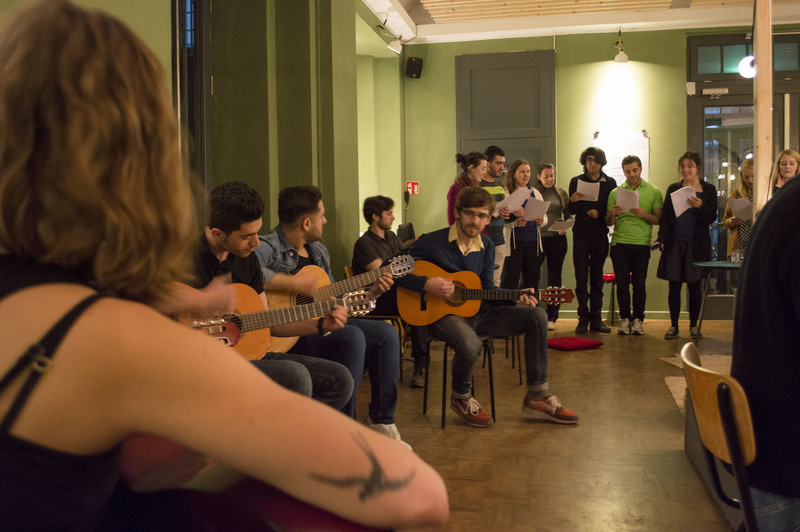 Guitar students and the Social Singing Group jamming. Photo: Dani Hasrouni. The process of starting the GSBTB Open Music School was not simple. I have no formal training in community organising. As it turned out, neither did most of the early volunteers who were so eager to help. What we did have, however, as a wonderful and diverse collection of semi-professional musicians and creative types, was experience. Years of experience in composing, songwriting, frustration, disappointment, the joy of musical-communion with others and everything else that comes with devoting yourself to the creative process. We also had plenty of experience in what it is like to be a migrant navigating a new home. We knew the struggles of learning new languages, bureaucratic systems and cultural subtleties well. We were (and still are) a misfit dream team! For these reasons the GSBTB Open Music School learned to crawl, walk, run, jump, fall and then judo-roll our way back to walking… We’re far from perfect, and we take things as they come. Step by step, hurdle by hurdle, like new migrants do. We are brave, like new migrants are. We don’t talk the talk until everyone is bored of the conversation. We make things happen, learn as we teach, and teach as we learn. Our migration stories are our strengths. The community continues to grow and evolve like a creative beast with a life of its own. I don’t really feel like I run the Open Music School (the teachers and students do). Perhaps I feel more like I just hold the leash that is tied to the beautiful beast. GSBTB Open Music School’s first Performance Night, with the author, Tom Young, blissing out among the students. Photo: Dani Hasrouni. Over the past two years, the Open Music School has grown to offer 14 weekly classes in guitar, piano, bass-guitar, singing and drums. We have multiple weekly workshops around electronic music production with our Open Music Lab and Music Unite. 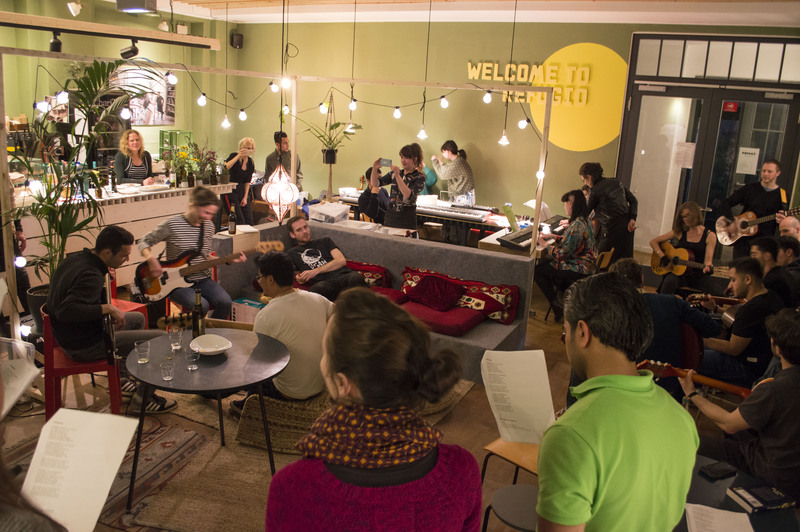 We’ve organised meet-ups for musicians that may need help finding their first steps into the Berlin music scene. We even offer occasional rap workshops for young women*. 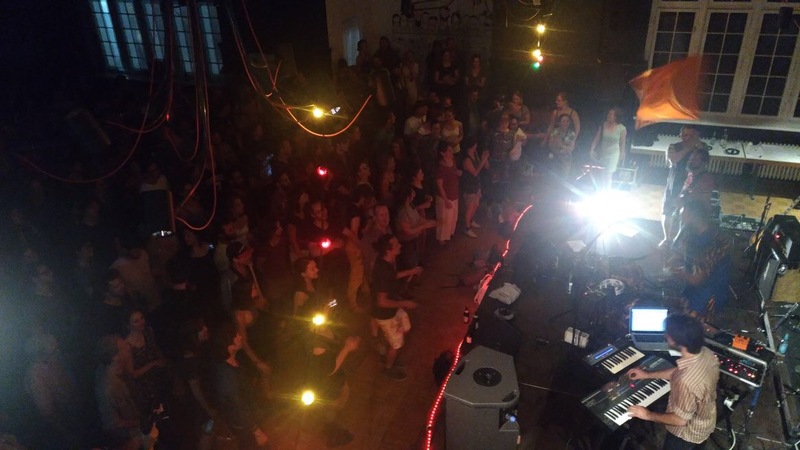 On top of all this, we organise semi-regular concerts and stages at festivals like Fête de la Musique, East Side Music Days and Ableton Loop… At least 100 people participate in the Open Music School in some way every week. It’s busy. GSBTB Open Music School’s Fête de la Musique stage going off, 2017. Photo: Abeera Atif. On Thursday, May 24, the GSBTB Open Music School will be two years old. We’re throwing a party to celebrate two years of the inclusion and empowerment of people from often marginalised communities through music. We’re calling this party New City Sounds #1: more event info here. It‘s a party to show that the GSBTB Open Music School is not slowing down. This is not a passing phase, just like human migration is no passing phase. We‘ll celebrate art, fun and friendship. We‘ll celebrate the creative potential that lives within migrant communities. Communities that help make this scar on the face of the earth such a beautiful place. Tom Young runs the GSBTB Open Music School.